These vegan cauliflower steaks are light, hearty and easy to make. Topped with a vibrant chimichurri sauce with a Mexican twist, this meal comes together in less than 30 minutes. 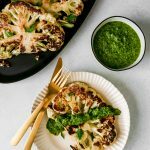 For this recipe, the cauliflower steaks are cooked in a screaming hot cast-iron skillet, but with summer just around the corner, they would also be great on the grill. So what are cauliflower steaks? Cauliflower steaks are, well, cauliflower cut into thick “steaks.” I know, using the word “steak” is deceiving, but what else should we call them? Steaks it is. Are we good? This recipe for vegan cauliflower steaks may be a bit different than others you’ve seen before. Many recipes call for roasting the steaks, and although that’s a great hands-off method, I prefer to cook my cauliflower steaks in a cast-iron skillet. The biggest reason being I like the char and I want my vegan cauliflower steaks to still have a bit of bite. No mushy veg here. How do you cut cauliflower into steaks? Chimichurri is a classic Argentinian sauce comprised of fresh herbs, olive oil, vinegar, and garlic. 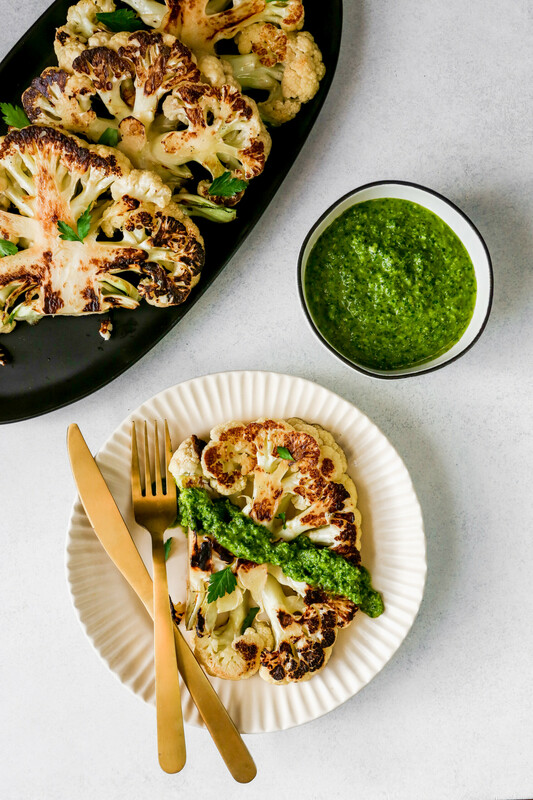 This Mexican take, featuring cilantro, serrano, and lime, is the perfect sauce to go alongside savory cauliflower steaks. 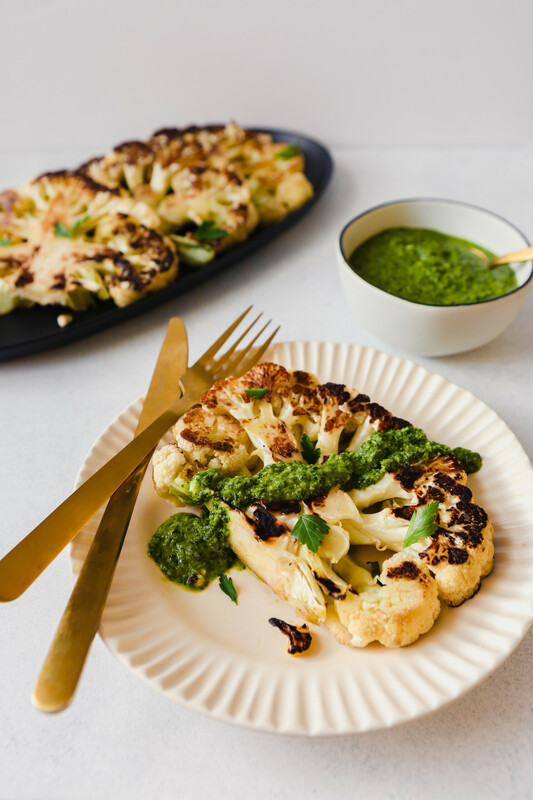 Hearty and satisfying vegan cauliflower steaks topped with a vibrant mexican-inspired chimichurri sauce. For the chimichurri, combine oil, lime juice and vinegar in a liquid measuring cup. Process cilantro, parsley, onion, oregano, garlic, serrano, salt, and zest in a food processor until minced. With processor running, stream in oil mixture until combined; season with salt and pepper. Chill until ready to serve. Trim leaves from cauliflower heads. Place heads steam side down and cut, top to bottom, into 1-inch thick slices, or “steaks” (you should get 4–6 total steaks). Arrange steaks on a sheet pan, brush both sides with oil, and season with salt and pepper. Coat a large cast-iron skillet with nonstick spray, heat skillet over medium-high for 5 minutes. Add 2 steaks to skillet, place an additional cast-iron skillet or weighted pan on top of steaks, and cook until charred, 3–4 minutes. Flip steaks and cook another 2–3 minutes until charred. Transfer to a serving platter and repeat with remaining steaks. 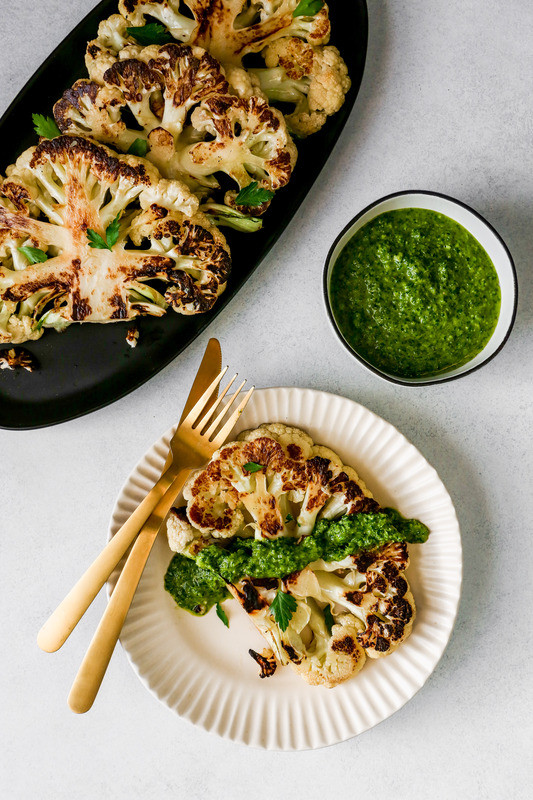 Serve cauliflower steaks with chimichurri sauce.